Not being blinded by the size of operations, Cape Flora is finding innovative ways to help small-scale fynbos entrepreneurs realise their business dreams. “Since our funding is quite limited, our strategy is aimed at unlocking these entrepreneurs’ full potential by empowering them with knowledge and linking them with strong networks,” says Jacky Goliath, Cape Flora SA’s director responsible for the transformation portfolio. 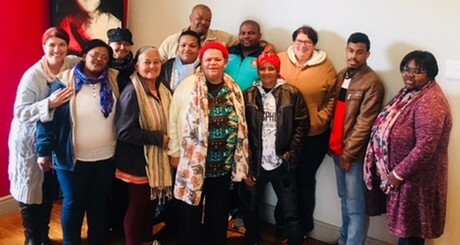 To this end, Cape Flora last year in March hosted a two-day information session that was attended by close to twenty potential small-scale fynbos entrepreneurs. During the first day, attendees visited a fynbos farm, nursery and packhouse near the airport to give them a glimpse of the workings and all the opportunities along the supply chain, while industry experts shared technical information about fynbos propagation, cultivation, pest and disease management as well as the fynbos market during the second day. A needs survey during the session revealed a strong demand for business skills development, which Cape Flora addressed through a business training session with business coach, Basil Myners in September last year for interested producers. “Being an entrepreneur myself, I realised that our efforts would only pay off if the businesses we serve were found on sound business principles – from business planning and cash flow management to sustainable business practices, production legalities and staff management,” Jacky says. So far, Cape Flora’s efforts are making a difference. Theo Adams, who farms near Harold, only attended the information session, but it was enough to help him secure an export market for future production. Cape Flora after the session also funded consultations with industry expert Dr Gerhard Malan, to help Theo establish his own plantations. Their farm was under hops when they bought it, but they want to replace the hops with indigenous crops, such as honey bush and fynbos that would blend in and match the natural beauty of Harold. “With Gerhard’s guidance, we planted two hectares of proteas in September and intend to plant another four hectares this year,” Theo says. Elizabeth, after the information session, started harvesting the abundance of fynbos growing naturally on her land, which she supplies to a wholesaler, and approached Cape Flora for help to establish her own plantations. Cape Flora helped her get soil and water analysis done to determine the viability of fynbos production and identify the best varieties to plant on the farm and funded consultations with Dr Gerhard to ensure she was on the right track from the start of her production journey. “I am set to plant five hectares of fynbos, but have to get an environmental impact assessment done if I want to plant more. My dream is to break into the export market and by doing so, create jobs in Hopefield so that the farm may become a safe haven, especially for women,” she says. For Loretta Afrikaner from TJ Agulhas Flowers, the business training once again highlighted the importance of sustainable harvesting on a flower picking business’ viability. “One of the first things I did when I got home, was to run through the fynbos industry’s code of best practices for wild harvesters with my staff, to ensure we were all on the same page. Fynbos is our main source of income. We will be out of jobs, without flowers to pick,” she says. To give her business a boost, Cape Flora also supplied her with R25,000 worth of pruning shears and worker uniforms. “These Felco shears are way too expensive to buy out of my own pocket. They allow my team to work much faster and efficient than they would have been able to with their old shears,” she says. For Leslie-Ann Pieters of Pieters Flowers the business training highlighted the importance of committing your goals to paper and having a solid business plan, especially when you want to access funding. She also made valuable connections during the session. Cape Flora, following the information sessions, started different WhatsApp groups, allowing entrepreneurs to share ideas, discuss issues and ultimately complement one another’s trade: “These groups are great. If you have an oversupply of a product, then someone, for example, may be able to buy the product in to add-value to their existing product offerings. This way we are helping each other grow,” Leslie-Ann says. Leslie-Ann started Pieters’ Flowers along with her husband in July 2018, after she hit a rut at the flower business where she worked for more than ten years. Pieters’ Flowers started out with her acquiring a picking permit to pick fynbos in Elim that she supplied to local vendors, with the ones in Adderley street in Cape Town being her first clients. She met a Chinese exporter via Cape Flora in November, through which she is now selling flowers in the Chinese market. “The fynbos has been received well in China and the exporter has sent me photos to better understand the demand in this market. Where the European market prefers natural looking flowers, the Chinese really like bright colours,” she says. Leslie-Ann dreams of going big one day: “There is this saying: ‘Go big or go home’, well I don’t want to go home. I want to link up with the right people, buy my own land and plant my own fynbos so that I can create a business that makes a difference by creating new jobs and boosting the Elim economy,” she says.